Is the fact that overregulation kills economic growth one of the country’s best-kept secrets? Or is it perhaps that the effects of overregulation are not widely understood or discussed. With all that’s been going on – the tax bill, the government shutdown, everything President Donald Trump says, does, wears, tweets or thinks – showing the downside of too many regulations and too much government doesn’t attract nearly as much attentions as it should. A huge number of Americans don’t understand how over-regulation negatively affects the economy, and quite a few subscribe to the idea that in order to keep greedy businesses in line, more regulation is needed. This condition provides bureaucrats and politicians to hurt the people they exist to serve by putting harmful regulations into effect. Every regulation businesses have to follow costs them money, increases the cost of products and services to customers, and makes operating a business profitably more difficult. Every dollar spent on non-productive and unnecessary regulatory compliance is a dollar that can’t be used for higher wages, better equipment, expansion and other beneficial things. Trump pledged to get rid of two existing regulations for every new regulation, which has never been done before. The actual reduction in regulations last year was even better than two for one, and the economy has shown its appreciation through job creation and higher GDP. 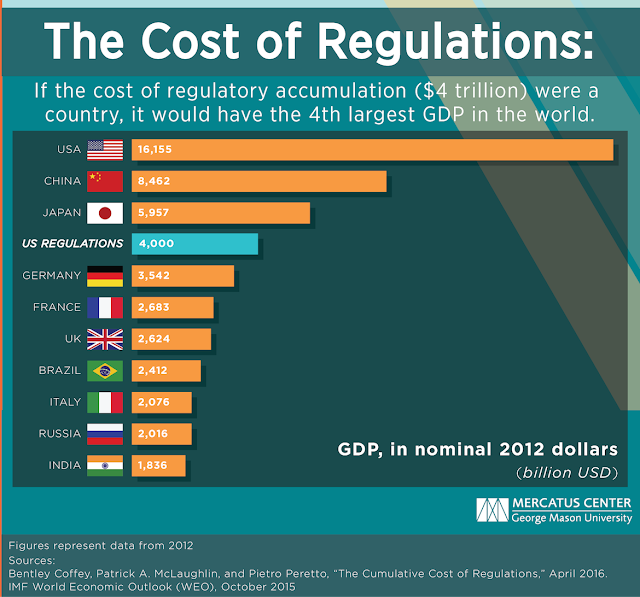 Research from Mercatus shows that if regulations since 1980 had just been held at that level, the economy would have been 25 percent larger by 2012. 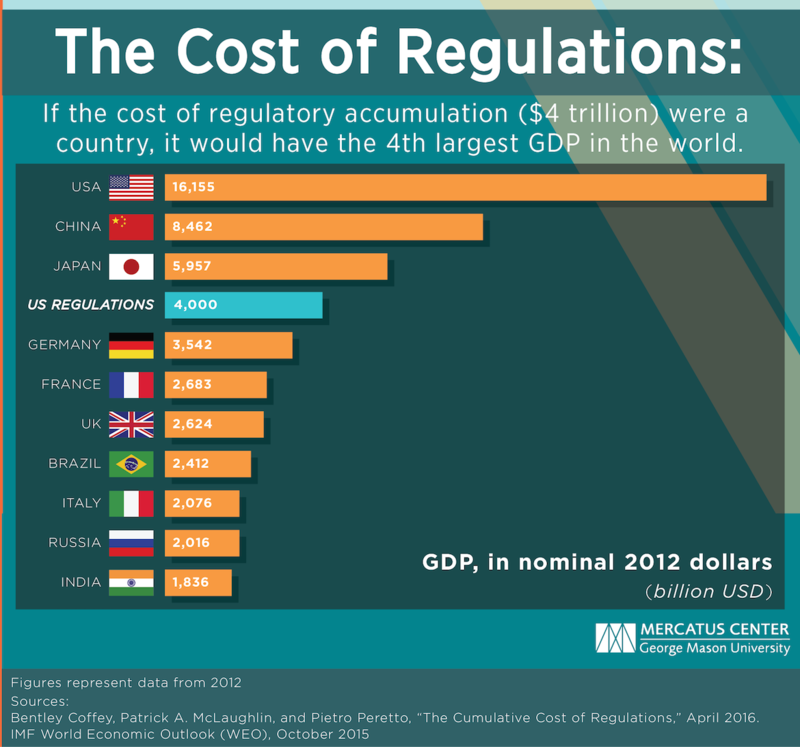 But regulations grew to the point that in 2012 the economy was $4 trillion smaller than it would otherwise have been. That works out to the equivalent of 32 million lost U.S. jobs. If that lost $4 trillion was a country’s economy, it would be the fourth largest economy in the world, McTigue wrote. One area where reducing regulations has had beneficial effects is in coal country. Last October Fox News reported coal production was down 31.5 percent over the last 10 years, but was up 7.8 percent to that point in 2017. Politifact noted that Fox had under reported the numbers, using projections rather than actual figures, which show production was actually 12 percent higher than at the same point the year before, and the decline over the last 10 years was closer to 33 percent. “Even so, we remain a long way from the 170 million tons we produced in 2008, before the Obama Administration began its war on coal. And we may never get back to those levels, because most of those 400 coal-fired power generation units Obama shut down with his regulatory assault have been torn down, left to rust or converted to natural gas,” Raney continued. In a state as badly damaged by regulatory warfare as any in the nation, West Virginia is dramatic evidence of both the horrors over-regulation causes and the benefits of getting rid of harmful government interference. West Virginia’s unemployment rate has fallen from double digits in late 2016 to 4.4 percent in November. Think what you will of Donald Trump, but he has been in business for a while, and he has been successful at it. And because of his experience, he knows that a prosperous nation needs successful and thriving businesses to provide needed and wanted goods and services, as well as the jobs that provide people the money they need to purchase those things they need and want, and to live a decent life. Regulatory reform and improvements to the tax system have already produced positive results in the economy, pushing unemployment to much lower levels than they have been for a while and pushing productivity to respectable levels after many years of unsatisfactory performance. We should be appropriately pleased with the good things happening in our country today, not overly critical of the person who has allowed them to occur. Who is more unstable? Trump, or his critics?